Panera’s Greek Salad is one of my favorite salads of all-time. I finally decided to figure out how to make it at home. A greek salad is all about the dressing (and the feta!) and this recipe does not disappoint! Panera’s Greek Salad is one of my favorite salads of all-time. The combination of feta cheese, fresh tomatoes, and even the red onions (although shouldn’t they be called purple onions?!) is such a perfect, perfect combo. If at this point, you’re thinking I totally forgot about the kalamata olives that so classically get paired with Greek Salads, no worries, I’m not an olive girl so I intentionally left them out. Anyways…because of my goal to eat out no more than once per week, I decided I should probably learn how to make my own Panera Greek salad at home. And what’s a Greek salad without the dressing that combines the whole thing together? This recipe for Homemade Greek Salad Dressing is beyond easy to make. You have two options for preparing it. 1. You can simply whisk all ingredients together, or…. 2. You can blend all of the ingredients together in the blender for a smoother, almost creamy consistency. I prefer option number 2, but if you don’t have a blender, no worries, this dressing is great even when simply combined with a whisk. At this point, you may be wondering what you could pair with this salad. First, you could always eat this as a main dish by adding some protein (grilled chicken or salmon would be lovely). Another great option would be to serve it with this recipe for Mediterranean Stuffed Chicken, one of my all-time favorite chicken recipes. I also like to use this dressing to season steamed veggies….. SO good! Leftovers will last in the fridge for a few weeks. Just give it a good shake before using it because the oil does tend to separate. At any rate, if you love Greek Salad’s as much as I do, you’ll find this salad dressing the perfect compliment to any salad. 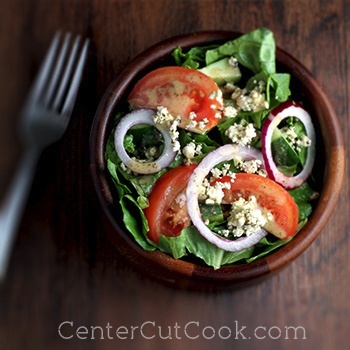 Notes: When I make Greek salads, I typically include romaine lettuce, fresh tomatoes, red onion, cucumbers, and feta cheese. Combine all ingredients in a blender for 30 seconds to 1 minute. Alternatively, combine all ingredients in a bowl and whisk together. Store any leftovers in an air-tight container in the refrigerator.